The GOrun 6 running shoes from Skechers have a difficult objective. They need to follow and improve the already successful GOrun 5, and in many cases, runners are skeptical about upgrades, especially when they already have available option to rely on. But the GOrun 6 shoes represent an easy solution both to new runners and to those who want to upgrade their shoes. This is mainly due to their impressive comfort and the seamless upper which makes them look apart. Made for a natural fit. Not recommended for small ankles. 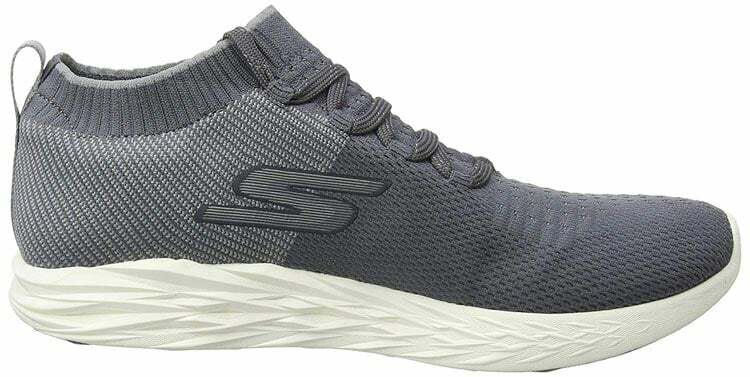 This is where Skechers managed to do a great job combining both the high collar and the front lacing system to offer runners a bit more dependability. The maintenance of this system is also above average. So instead of always pulling the collar left and right to adjust the shoes when you put them on, you also get the benefit of the back pull tab. The accessory is not high tech by any standards, but its role is to protect the knitted collar and to improve your user experience as well. The shoes are not your typical solution to run around the block as they can be seen as a high value when it comes to fit. Made with a high collar design, they implement some of the changes in fit which are highly praised by runners and other athletes in other sports as well. But if the collar can weaken over time in some cases, the same cannot be said about the traditional lacing system. Who uses the GOrun 6? It’s always worth to address the main issue of running shoes early on. This is where the GOrun 6 will divide opinions, and it can drive their efficiency down to personal preference. This is mainly due to the collar of the upper. While it is not one of the high collars on the market, it is still a collar. This means that not every runner likes it. In theory, a collar comes with that sock-like fit which should improve the overall experience. If you have larger ankles or even regular ankles, the fit can be great for you. If you have thinner ankles, the knitted collar might not be the best option regarding comfort. There is certain distrust when it comes to using the running shoes with the collar. Even with the added front lacing, the stretchiness of the upper might make many runners look to other options when it comes to fit. But things change once you start running. One of the main areas to look for when it comes to running shoes involves the outsole. As it can negatively affect otherwise smart designs, the outsole is important both for durability and for flexibility. The GOrun 6 shoes have an outsole which reflects the entire theme of the shoes which is based on flexibility. With good flexion in the forefoot, the outsole of the shoes feels like a winner. Made with a 20mm heel and a 16mm forefoot, the outsole is distinguishably comfortable. As you want the road shoes to be a great solution for a more natural feel and the freedom it comes with, the outsole proves to be a good foundation for this reason. With blown rubber construction, the outsole seems very similar to the GOrun 5. While the previous series was not particularly known for durability, the GOrun 6 comes with small improvements in this area. Even so, many runners feel that the durability of the outsole is fair when compared to the affordability of the shoes. While the outsole of the shoe is improved in terms of durability, many runners feel they will actually get around 200 miles of top performance which is very similar to the previous version of the shoes in terms of durability. When it comes to the running base, you need to know that it is not always easy to find the right design for a knitted upper. Manufacturers are always torn between the extra flexibility of the upper and the rigidity which is needed with the outsole while still maintaining that overall flexible feel. The Flex-Gen technology dominates the midsole of the shoes. The technology allows the midsole to offer good flexibility without sacrificing responsiveness. The cushioning is not bad either, and it represents a comfortable solution for most runners. With a 4mm drop, the shoes actually feel fast. At the same time, the midsole is also completely removable, and this means that you can add your own custom solution if you feel you need to cater the GOrun 6 to your needs further. This can involve orthotic options if you have any special requests. You can even consider solutions which offer better flat feet support, but you also need to know that some of the custom midsoles will also considerably change the feel of the shoes. The upper of the running shoes is both attractive and polarizing. The knitted upper is actually made for the sock-like feel and fit which contours the foot. For this objective, the upper offers plenty of flexibility and even a good fit for the average size foot. Of course, the lacing will not be as tight as some may expect, especially if you are a big fan of the closer fit. But at the same time, the entire lacing and upper maintain flexibility which is important for a running experience which is closer to a natural barefoot approach. Even with this stretch design, Skechers added the heel counter which can further improve lockdown. Running in the shoes feels comfortable, and you have better flexibility when it comes to lateral movements as well. This can only lead to an improved comfort which is so necessary when it comes to long-running sessions. Marathon runners or even amateur runners know the pain which is often caused by a poorly-designed upper. Many of the pressure points which cause pain can involve the traditional tongue design and the heel cup area. But this is not the case with the GOrun 6 as the shoes manage to offer flexibility in these areas. The knitted collar also plays a role in this natural feel of the upper. It comes to wrap the ankles, and its elasticity works for most people when it comes to better overall stretchiness and comfort. While it is not a design to please all runners, you need to know that it maintains its stretchiness very well in time. This is partly due to the pull tab at the back of the shoes which allows you to handle them better. It is also true that the collar will collect dust particles over time, just as a regular sock. The good news is that the knitted material can be easily cleaned with the help of detergent and water. You can do this yourself gently. This way, you ensure that your collar is always clean and in good condition free from any sweat stains. With good breathability since there are no overlays to consider, the upper represents a solution for better heat control as well. The lightweight design of the shoes is thus highly recommended when it comes to a more natural feel. In most cases, this small breathability improvement will only be seen on longer runs, but it can be one of the main reasons to consider the GOrun 6 as the solution for your running needs. Many runners can have mixed feelings about the GOrun 6 Sketchers. There are clearly not made to please every runner. If you are a fan of faster running and you need good shoes both for training and racing, the GOrun 6 can be the shoes to consider. Their lightweight construction with the good flexibility of the upper and of the outsole recommends them for all types of users. In terms of fit, they also adhere to the natural feel seen with the knitted upper design. But the GOrun 6 shoes stand out from the competition when it comes to aesthetics. Runners which will most appreciate them will be those who can love the simplicity of a modern design which is not always easy to achieve. With the distinctive low collar, the running shoes treat aesthetics with the same importance as performance.